Need the sound of a ’909′ in the track you are working on? 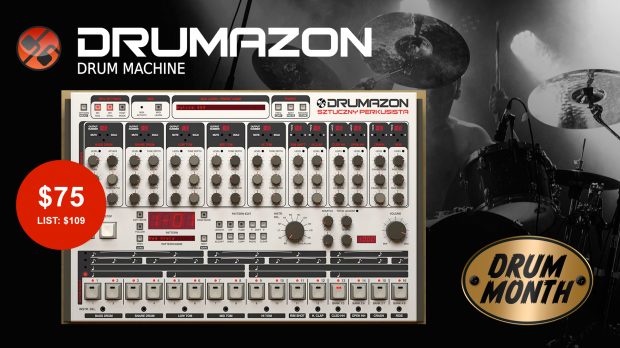 D16′s Drumazon is the answer with its amazing emulation of the original 909 drum machine. On ‘Drum Month’ promo at over 30% off. Drumazon synthesis emulates all the sounds of the original 909. All the modules are coded to match their analog counterparts, down to each nuanced detail. As a virtual bonus, all Drumazon instruments have enhanced controls. This extra functionality allows the user to adjust the sounds further than on the original unit. This opens up a whole new world of sound creation! Listen to the audio demos or tweak it yourself with the demo version. This entry was posted in DontCrack, Promotions, Virtual Instruments and tagged D16, Dance Drums, Drumazon, Hip-Hop drums, Roland 909 emulation. Bookmark the permalink.